We are pleased to continue the tradition of screening top-quality films at SFGE, and gladly welcome World 1-1 to the 2015 show! World 1-1 is the first in a documentary series on the history of video games. This chapter is about Atari and how they created a new industry. It focuses on the business deals, the personalities of the pioneers, and the creations of the engineers. This documentary is a combination of interviews, archival footage, and reflection that retells the story to a new generation that may not know the roots of their favorite hobby. World 1-1 will follow the early games before the arcade machine even existed. 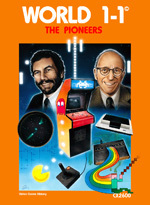 It tells the story of how Atari created the games industry years before it should have happened and follow the lucky deals and unfortunate mistakes that almost destroyed the entire industry just as quickly as it was born.